One of the earliest flowering native plants is the Lesser Celandine, member of the buttercup family. Although these are often seen in February, they are most commonly in flower from March through to June. In fact their name, Celandine, is derived from the Greek name for the swallow, Chelidon, as they are both seen as early indicators of spring. Celandines (actually Lesser Celandines) are noticeable by the mass of bright yellow star-like flowers that are seen on a carpet of dark green leaves. If you look closely you will see that there are between eight and twelve glossy petals on each of the flowers. You may also notice that the leaves are heart shaped near the ground, often with white markings, and become smaller and more ivy-leaf shaped closer to the flowers. Celandines love the sun and are found all over the county, particularly in clay soil, at the roadside, or on sunny banks – the old railway track in Daventry often has some close to town. When the sun goes in the petals close up, reopening as soon as the sun comes out again. 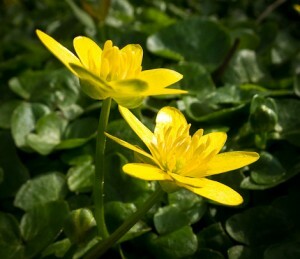 Such is the effect of the bright shiny flowers that celandines have been referenced in many poems over the years, they were particularly favoured by William Wordsworth who wrote an ode to the Lesser Celandine. All traces of this, and the following flower will have gone by mid-summer, the leaves and flowers dying away completely. Another flower to look out for in March is the incredibly pretty wood anemone. As the name suggests, it is mainly found in wooded areas (dry and deciduous please), although it can be found in old hedgebanks – as long as there isn’t too much shade. In common with the celandine, it likes sunshine and therefore does all of its flowering before the leaves are out on the trees and only opens when the sun is out. The exquisite (but scentless) white flowers are held above dark green palmate leaves, just one flower per plant. The flowers are often flushed with a little bit of pink. Again, just like the celandine, it flowers too soon to attract many insects and so propagates underground – although in this case very slowly. 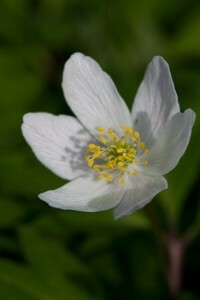 Another name for the wood anemone is the windflower. According to Greek mythology, Anemos, the wind, used the star-like flowers to herald his coming in Spring. The delicate flower stems are strong, but supple enough, to bend and not break in the March winds. It is also called the thimbleweed and smell fox, the latter being an allusion to the musky smell of its leaves. Wood anemone has few medicinal uses due to the fact that it is toxic to humans and most animals causing amongst other things skin and gastrointestinal irritation, burning mouth and throat sensations, mouth ulcers and nausea.